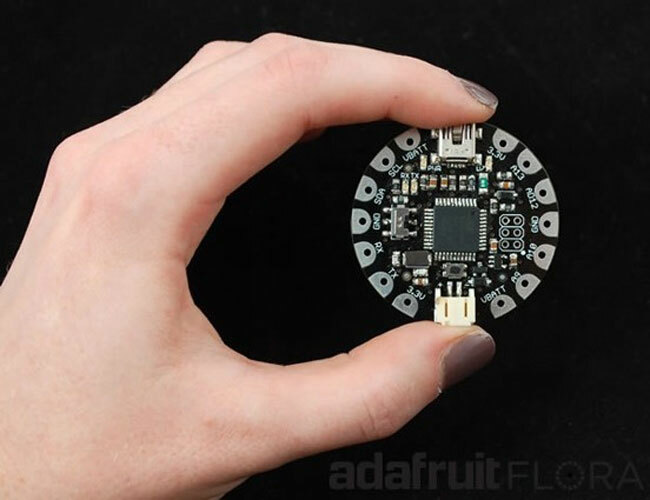 Adafruit the open source hardware manufacturer has this week unveiled a new product to its line of products in the form of the Adafruit Flora a new wearable electronics platform. The Adafruit Flora modules have been designed to provide an easy way to add Bluetooth, GPS, 3-axis accelerometer, compass module, flex sensor, piezo, IR LED, push button, embroidered + capacitive keypad, and OLED features to clothing. Watch the video after the jump to see it in action. The new Adafruit Flora modules come complete with built-in USB support in the form of a mini B port although it may change to microUSB in future iterations says Adafruit, together with USB HID support. Unfortunately the new Adafruit Flora modules are still currently under beta development so they are not available to purchase just yet. Although you can signup for more information and to be notified once they do arrive over on the Adafruit website. The Adafruit Flora modules are fitted with a reset button, 4 indicator LEDs, and 14 sewing tap pads for “attachment and electrical connections”. Adafruit says it will fully support Flora and provide tutorials and projects for the platform once it launches.